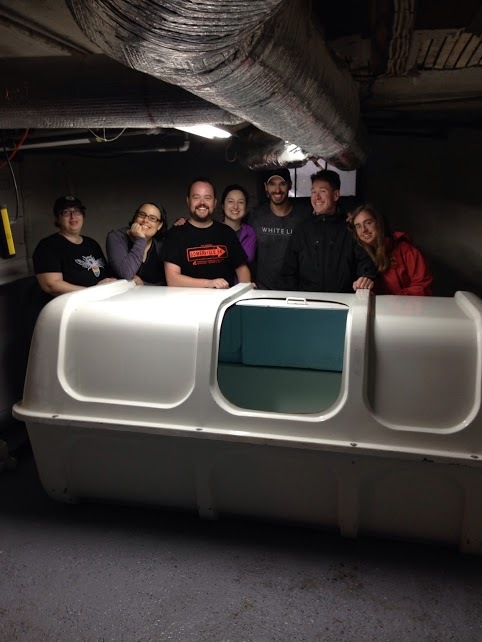 A couple weeks ago, half a dozen of our most awesome friends showed up on a Sunday afternoon to help us wash and move the tank. It had been sitting outdoors for at least three months — I’m not really sure how long the guy I bought it from had had it in his yard. It was grungy. Once in the basement, the electrical went together simply enough. There’s an ugly tangle of extension cords I wish we could do something about, but most importantly it’s all protected by a GFCI switch. Safety before beauty. It’s good learning for when we build out the centre — more outlets are needed than you’d think, between the pump and heater and lights and shop vac and occasional power tools. The plumbing, however, was more of a problem. I glued everything together — technically, PVC cement partially dissolves the plastic and creates a chemical weld — and then filled the tank with plain water to check my work, and promptly got a couple of drips. It could have been my inexperience with PVC that didn’t do the joints right, or else I might not have seated the union fittings correctly, but my main theory is that flexible hose was not quite flexible enough, and torqued the joints a little too much to let them seal completely. I tried fixing the drip with caulk, which totally failed to harden. I thought perhaps it was the drip from the joint keeping the caulk from curing, so I pumped out the tank so I could work dry. The pump I bought was DOA. Waited a few days for a replacement to be delivered. Even completely dry, the caulk didn’t cure. My tube, evidently, had been sitting in the garage too long. Got a new tube and redid it again. It’s awkward work, particularly on the underside of the joint an inch off the ground, where I have to apply with my finger and cannot see what I’m doing. Filling the tank again, the leak … was reduced. Applying a little more caulk with my finger, I got it down to less than a drip every few minutes, and decided the heck with it. I’ll put a little tray there and call it a day. We’re going to lose a lot more water than that just from wet people getting out of the tank. Back on the phone, I found another place willing to make a special order for me. The price was $100 higher and they didn’t deliver, but you have to make some trade-offs to get non-imaginary salt. Let me put in a good word for Sam at Wilson Farm in Lexington. Picking it up in my Hyundai hatchback, we got 600 lbs in the car before the shocks started looking stressed. Two loads it would have to be, then, but otherwise ferrying the half ton of salt was straightforward. When I’m buying salt for four tanks at once, though, we’re going to need a truck. It takes a long time to dissolve that much salt. We started Thursday afternoon, and had managed less than 200 lbs by Friday morning. Stirring occasionally by hand with a broomstick was not cutting it. I dug into my brewing supplies and found the stirring attachment for my hand drill — it’s meant for use in 5-gallon glass carboys and looks comically small in an eight-foot tub, but it really did get the water moving, and dissolving started going much faster after that. By Sunday evening, we had 800 lbs dissolved and the specific gravity up to 1.24. This is in the ballpark of what we’re looking for — close enough that I want to get in the tank and try it out before deciding how much more salt we might need. There’s one last snag, though. The tank temperature has stalled out at 75°F (24°C), even with the heater running at max 24 hours a day. It’s just not cutting it — we need a temperature of 94°F (34°C) for comfort. The heater is a flat pad underneath the tank, and totally inaccessible at this point short of draining the tank (with its $500 of salt already dissolved) and disassembling everything I’ve spent the last three weeks putting together. I really don’t want to go there. Instead I have an order in for an immersion bucket heater for some additional oomph. And since I’ve already had to build my own temperature controller, I can plug in and run this new element in parallel off the same system. It’s far from ideal, but with luck it will work. I’ll also wrap the tank in some additional insulation, which can’t hurt. Another few days to wait. I’m getting really impatient.